As recent air quality reports from Toronto Public Health and Public Health Ontario highlight, improvements in the Toronto-area outdoor air quality have come to a standstill of sorts. With more people moving to major cities in search of jobs and more vehicles entering major thoroughfares, levels of the three main pollutants—nitrogen dioxide, ozone, and particulate matter—are actually rising in some areas, undoing 10 solid years of air quality gains. Ontario does not bear all the blame here—about 30 percent of introduced outside air pollution in our area makes its way across the border from the United States. If you suffer from allergies, asthma, or another respiratory condition, or if you have a child or elderly loved one who does, this is definitely not good news. In this case, clean outdoor air is not just a human right. It is a vital health need. While it may not always be possible to control the quality of the air outside, you retain full ability to control the quality of your indoor air. In this post, we will teach you how to do this in four easy steps! Before you can effect any lasting positive change on the quality of your indoor air, it is first necessary to stop polluted outside air from sneaking in. This is most common in older spaces that were built to be less airtight than today’s new construction. Time and normal wear and tear can cause cracks and leaks in windows, doors, walls, and floors. As well, insulation eventually thin and wear out. 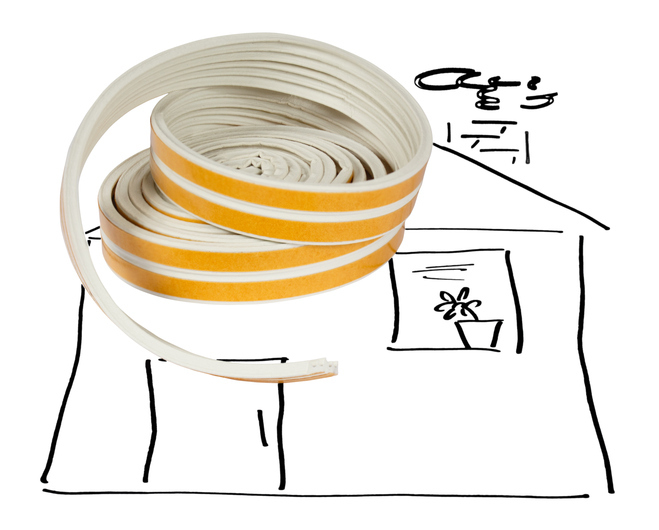 Weatherstripping offers an easy and economical way to reseal leaks and cracks to keep inside air in and outside air out. Adding extra insulation around air ducts, exhaust vents, and other key areas can also help with both inside air purity and energy efficiency. In this age of rogue outside air pollutants, figuring out how to ventilate (refresh) your inside air safely can be tricky. The traditional method, of course, is to open windows and doors on nice days while running ceiling and floor fans for extra air movement. But if your outside air has become particularly toxic due to nearby traffic or industry, this won’t work. Luckily, we have another, even better solution to offer. You can install a heat recovery ventilator that works with your HVAC system to keep your indoor air fresh and pure. A heat recovery ventilator ensures total isolation between incoming and outgoing air inside your home. Oxygen-poor stale inside air needs to get out so it can be replaced with new oxygen-rich fresh air. In traditional HVAC systems, it is challenging to keep these two air streams completely separate. But with a heat recovery ventilator installed, these two air streams each have their own dedicated passage, so they never mix. As a bonus, the heat recovery ventilator will also remove extra moisture (humidity) to keep your home from falling prey to mould or mildew. There are two approaches you can take to ensure the inside air you are breathing in is free from outside air pollutants, toxins, and allergens. You can choose one or both depending on the amount of outside air pollution in your area and your family’s individual health needs. A HEPA (high efficiency particulate air) filtration system can capture and filter out even the tiniest airborne particles with a 99.97 percent effectiveness rate. This makes the HEPA system the world’s best filtration system. If you have a newer energy efficient HVAC system, you may be able to install a whole-home HEPA system to work with your air conditioner, furnace, and heat recovery ventilator. If you have an older HVAC system that still has some useful life left in it, you may be better served by choosing a portable HEPA filtration unit for individual rooms. Another fabulous and effective option for purifying your inside air supply is a UV-based purification system. Like HEPA filtration systems, UV purification systems come in whole-home and portable units depending on your current HVAC system and your family’s individual needs. Everything we have shared with you here can definitely improve the quality and purity of your inside air supply. But even all of these tools can only do so much if your air duct system has not been cleaned in some time or (in the case of many older homes) ever. Like any other area of your home, over time, dust and debris can build up inside your air duct system. This isn’t something the average homeowner can clean out. Our professional indoor air duct cleaning packages take three to five hours (depending on the size of your space) and include a complete vacuuming, deodorizing, and sanitizing as well as additional options depending on your home’s needs. Once you have your indoor air duct system professionally cleaned, the toxins, pollutants, and allergens that were trapped inside your duct system will be gone. You don’t have to worry that they are getting pushed through the air vents to aggravate your family’s respiratory systems and cause allergies and illness. From now on, a maintenance call, the frequency of which depends on where you life and if you have pets, etc.,) will suffice. Here at Clean Air Solutions Hamilton, we work closely with our sister company, Shipton’s Heating & Cooling, to ensure our clients’ have the cleanest, freshest, and most energy efficient and affordable inside air. Give us a call at 905-544-2470 to set up your consultation!